This April Fools was significantly lacking in All Star Batman and Robin. Did ASB&R finish up it’s first arc? I’m curious if this new series is a second arc continuing from the first, or if it’s just the series continuing with a new name. I’m also curious how DC would publish it in trade… if it’s one big arc, it should be one big book (or two volumes). Even crazy old people such as yourself deserve to have your entertainment packaged properly. 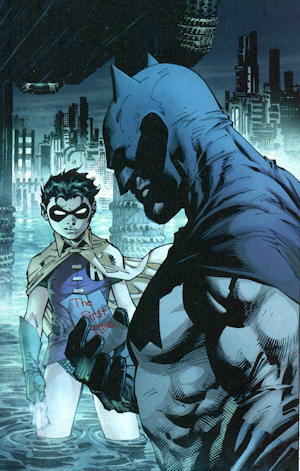 I see that they’ve outfitted Robin with Incandescent Bat-Tights.